Television Television marked the beginning of a phenomenon that was to have a major impact on news, advertising, film, radio, and the world -- not to mention. 1 Television Television marked the beginning of a phenomenon that was to have a major impact on news, advertising, film, radio, and the world -- not to mention how millions of people would spend their leisure hours. 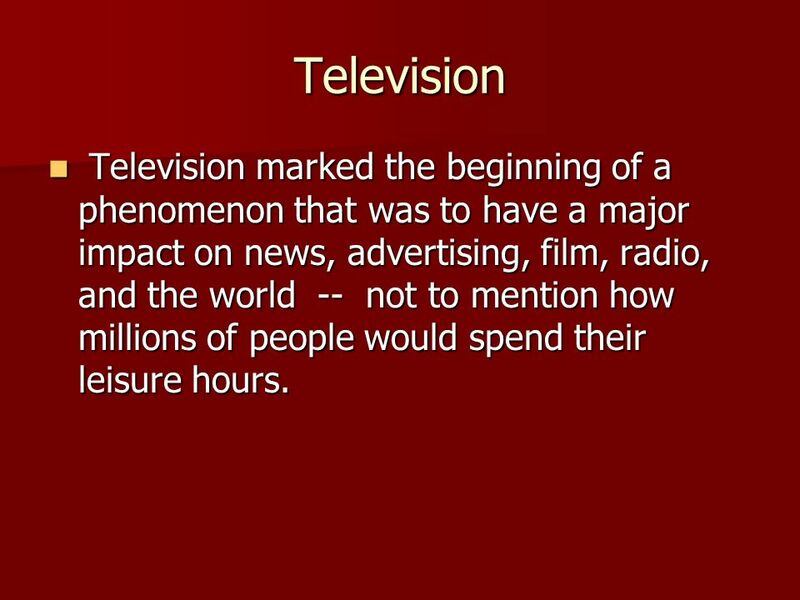 Television marked the beginning of a phenomenon that was to have a major impact on news, advertising, film, radio, and the world -- not to mention how millions of people would spend their leisure hours. 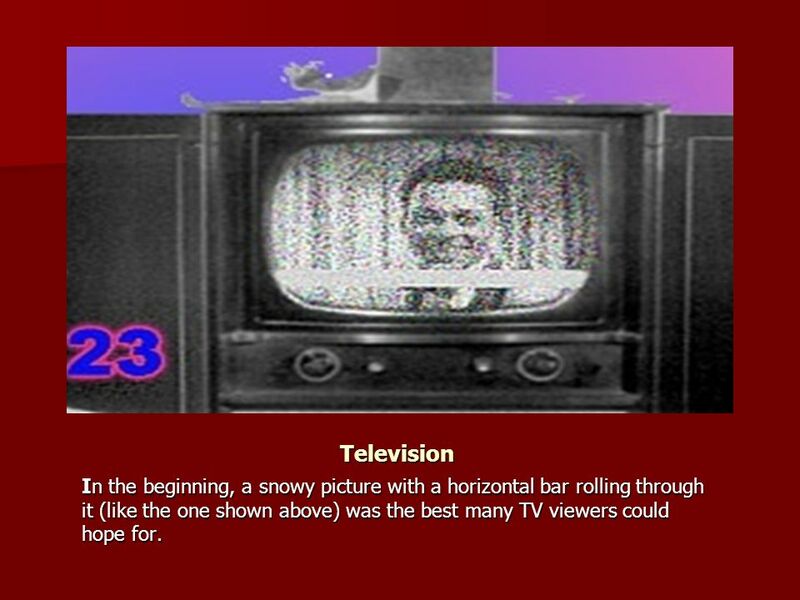 2 Television In the beginning, a snowy picture with a horizontal bar rolling through it (like the one shown above) was the best many TV viewers could hope for. 5 Frame rate Frame rate, or frame frequency, is the frequency (rate) at which an imaging device produces unique consecutive images called frames. The term applies equally well to computer graphics, video cameras, film cameras, and motion capture systems. 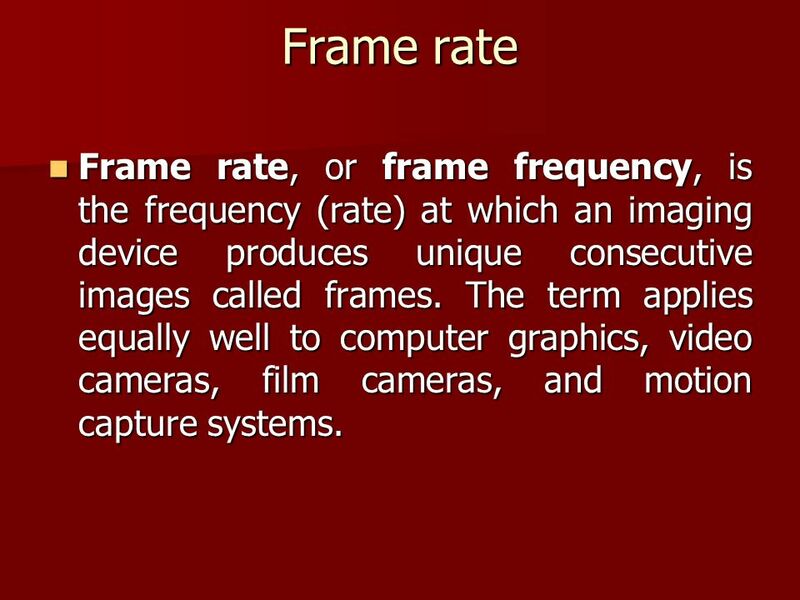 Frame rate, or frame frequency, is the frequency (rate) at which an imaging device produces unique consecutive images called frames. The term applies equally well to computer graphics, video cameras, film cameras, and motion capture systems. 6 Frame rates in film and television 50i (50 interlaced fields = 25 frames) is the standard video field rate per second for PAL and SECAM television. 50i (50 interlaced fields = 25 frames) is the standard video field rate per second for PAL and SECAM television. 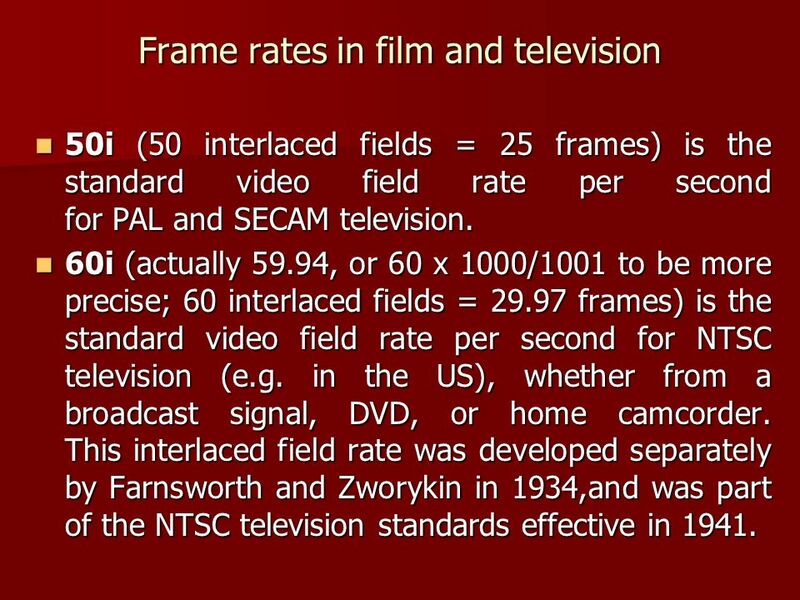 60i (actually 59.94, or 60 x 1000/1001 to be more precise; 60 interlaced fields = 29.97 frames) is the standard video field rate per second for NTSC television (e.g. in the US), whether from a broadcast signal, DVD, or home camcorder. This interlaced field rate was developed separately by Farnsworth and Zworykin in 1934,and was part of the NTSC television standards effective in 1941. 60i (actually 59.94, or 60 x 1000/1001 to be more precise; 60 interlaced fields = 29.97 frames) is the standard video field rate per second for NTSC television (e.g. in the US), whether from a broadcast signal, DVD, or home camcorder. This interlaced field rate was developed separately by Farnsworth and Zworykin in 1934,and was part of the NTSC television standards effective in 1941. 7 Frame rates in film and television 30p, or 30-frame progressive, is a noninterlaced format and produces video at 30 frames per second. Progressive (noninterlaced) scanning mimics a film camera's frame-by-frame image capture and gives clarity for high speed subjects and a cinematic-like appearance. Shooting in 30p mode offers video with no interlace artifacts. 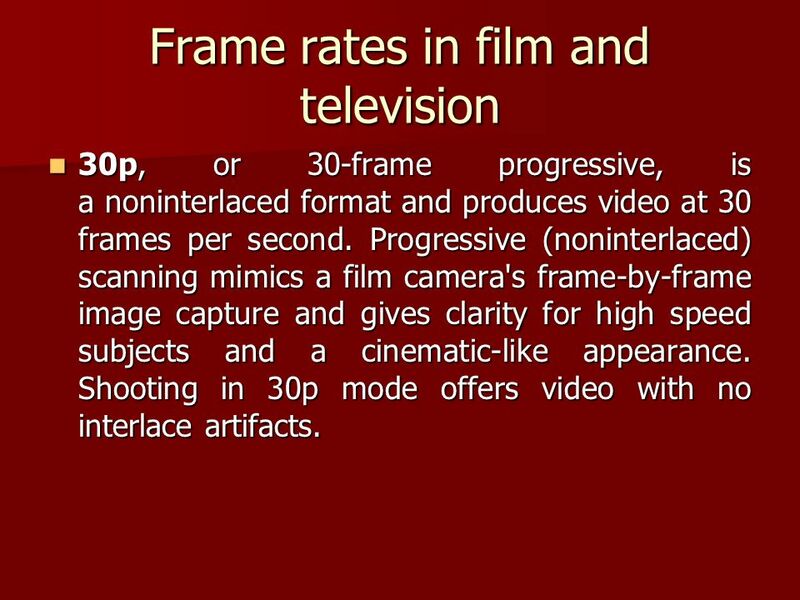 30p, or 30-frame progressive, is a noninterlaced format and produces video at 30 frames per second. Progressive (noninterlaced) scanning mimics a film camera's frame-by-frame image capture and gives clarity for high speed subjects and a cinematic-like appearance. Shooting in 30p mode offers video with no interlace artifacts. 8 NTSC NTSC, named for the National Television System Committee, is the analog television system used in most of North America, most countries in South America, Burma, South Korea, Taiwan, Japan, Philippines, and some Pacific island nations and territories (see map). NTSC is also the name of the U.S. standardization body that developed the broadcast standard. The first NTSC standard was developed in 1941 and had no provision for color TV. NTSC, named for the National Television System Committee, is the analog television system used in most of North America, most countries in South America, Burma, South Korea, Taiwan, Japan, Philippines, and some Pacific island nations and territories (see map). NTSC is also the name of the U.S. standardization body that developed the broadcast standard. 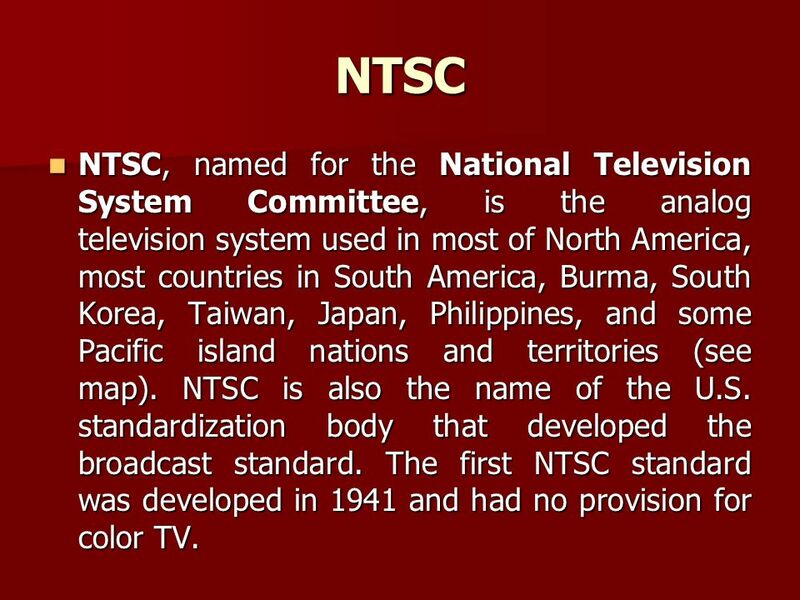 The first NTSC standard was developed in 1941 and had no provision for color TV. 9 SECAM SECAM, also written SÉCAM (Séquentiel couleur à mémoire [, French for "Sequential Color with Memory"), is an analog color television system first used in France. A team led by Henri de France working at Compagnie Française de Télévision (later bought by Thomson) invented SECAM. It is, historically, the first European color television standard. 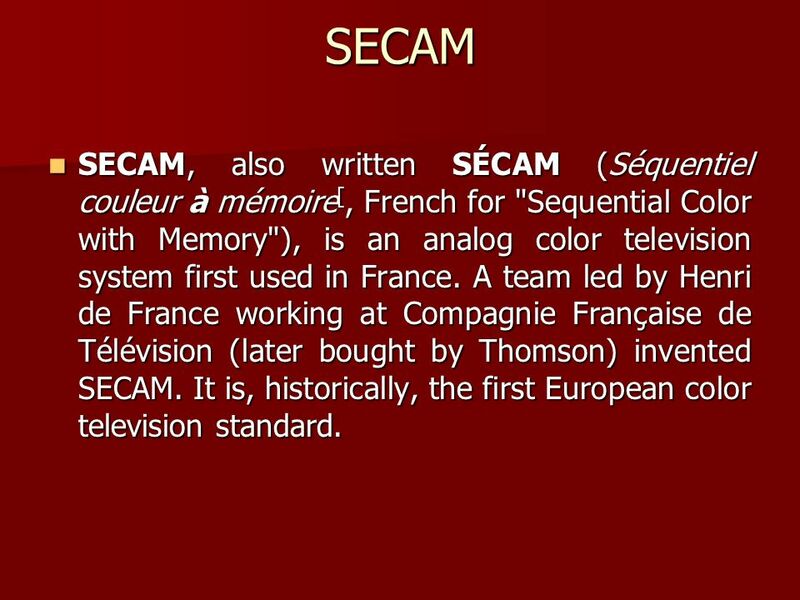 SECAM, also written SÉCAM (Séquentiel couleur à mémoire [, French for "Sequential Color with Memory"), is an analog color television system first used in France. A team led by Henri de France working at Compagnie Française de Télévision (later bought by Thomson) invented SECAM. It is, historically, the first European color television standard. 10 PAL PAL, short for Phase Alternate Line, is an analogue television encoding system used in broadcast television systems in large parts of the world. 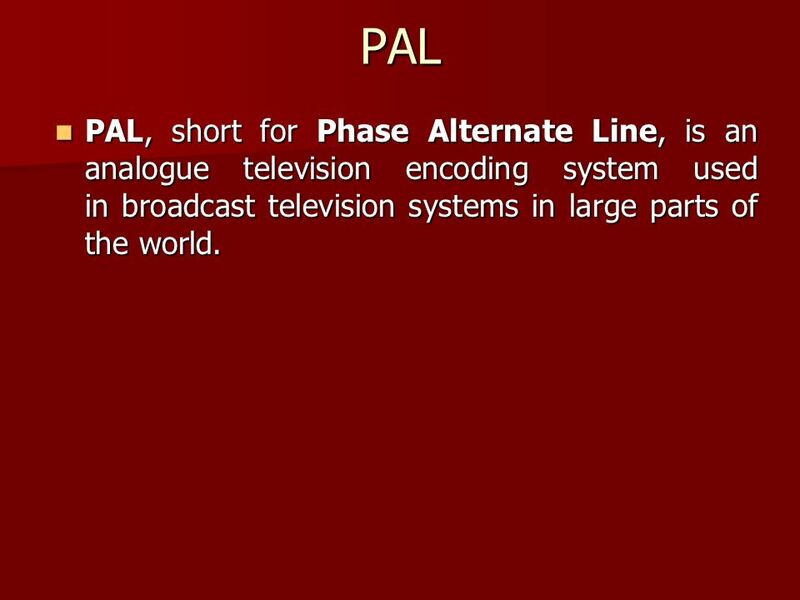 PAL, short for Phase Alternate Line, is an analogue television encoding system used in broadcast television systems in large parts of the world. 11 ATSC (standards) ATSC is a set of standards developed by the Advanced Television Systems Committee for digital television transmission over terrestrial, cable, and satellite networks. ATSC is a set of standards developed by the Advanced Television Systems Committee for digital television transmission over terrestrial, cable, and satellite networks. 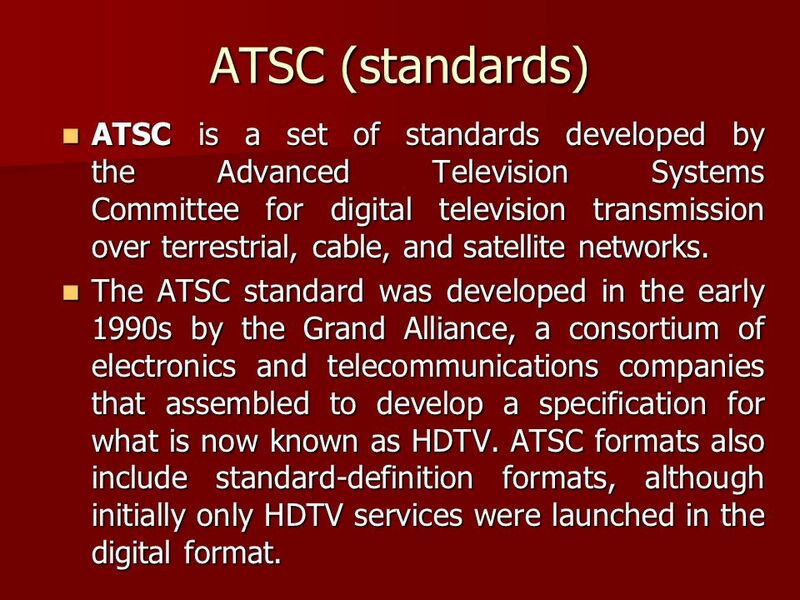 The ATSC standard was developed in the early 1990s by the Grand Alliance, a consortium of electronics and telecommunications companies that assembled to develop a specification for what is now known as HDTV. ATSC formats also include standard-definition formats, although initially only HDTV services were launched in the digital format. The ATSC standard was developed in the early 1990s by the Grand Alliance, a consortium of electronics and telecommunications companies that assembled to develop a specification for what is now known as HDTV. ATSC formats also include standard-definition formats, although initially only HDTV services were launched in the digital format. 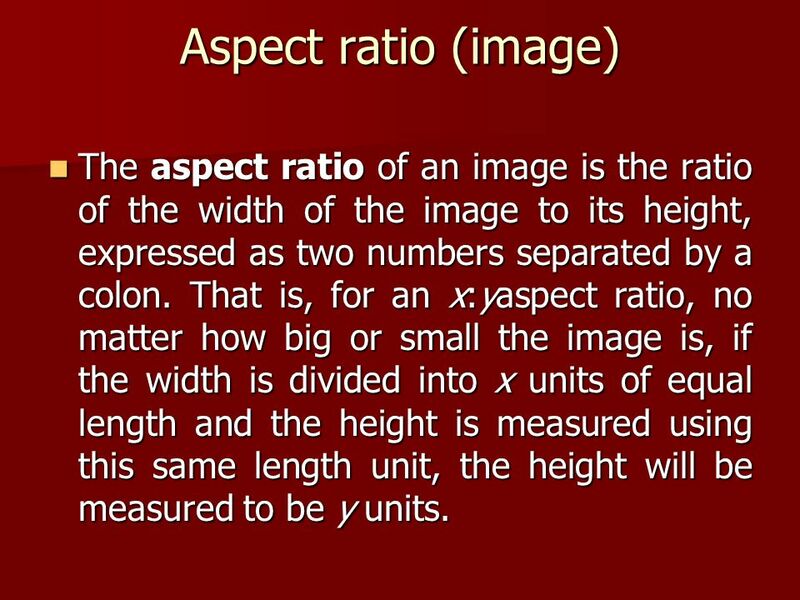 12 Aspect ratio (image) The aspect ratio of an image is the ratio of the width of the image to its height, expressed as two numbers separated by a colon. That is, for an x:yaspect ratio, no matter how big or small the image is, if the width is divided into x units of equal length and the height is measured using this same length unit, the height will be measured to be y units. 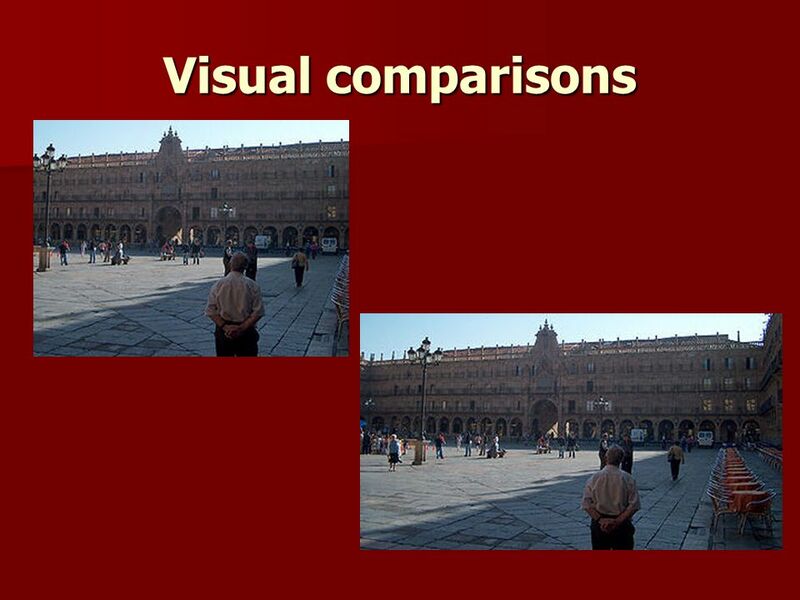 The aspect ratio of an image is the ratio of the width of the image to its height, expressed as two numbers separated by a colon. That is, for an x:yaspect ratio, no matter how big or small the image is, if the width is divided into x units of equal length and the height is measured using this same length unit, the height will be measured to be y units. 13 Aspect ratio Two common videographic aspect ratios are 4:3 (1.33:1), universal for standard- definition video formats, and 16:9 (1.78:1), universal to high-definition television and European digital television. 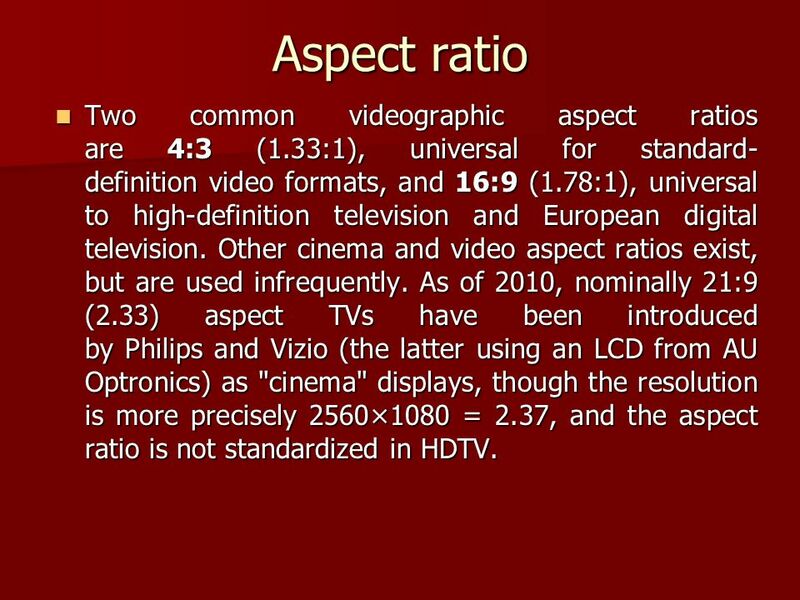 Other cinema and video aspect ratios exist, but are used infrequently. As of 2010, nominally 21:9 (2.33) aspect TVs have been introduced by Philips and Vizio (the latter using an LCD from AU Optronics) as "cinema" displays, though the resolution is more precisely 2560×1080 = 2.37, and the aspect ratio is not standardized in HDTV. Two common videographic aspect ratios are 4:3 (1.33:1), universal for standard- definition video formats, and 16:9 (1.78:1), universal to high-definition television and European digital television. Other cinema and video aspect ratios exist, but are used infrequently. As of 2010, nominally 21:9 (2.33) aspect TVs have been introduced by Philips and Vizio (the latter using an LCD from AU Optronics) as "cinema" displays, though the resolution is more precisely 2560×1080 = 2.37, and the aspect ratio is not standardized in HDTV. 14 4:3 standard The 4:3 ratio (generally named as "Four-Three", "Four- by-Three", "Four-to-Three", or "Academy Ratio") for standard television has been in use since television's origins and many computer monitors use the same aspect ratio. 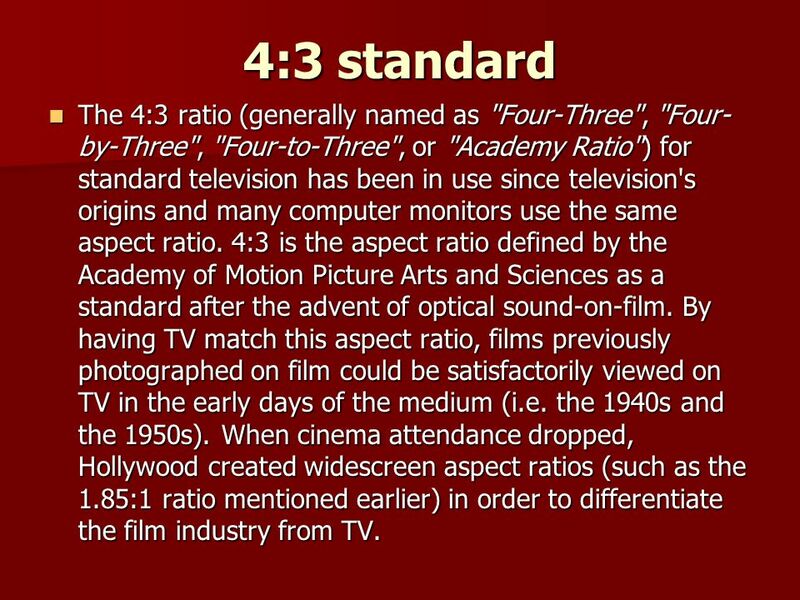 4:3 is the aspect ratio defined by the Academy of Motion Picture Arts and Sciences as a standard after the advent of optical sound-on-film. By having TV match this aspect ratio, films previously photographed on film could be satisfactorily viewed on TV in the early days of the medium (i.e. the 1940s and the 1950s). 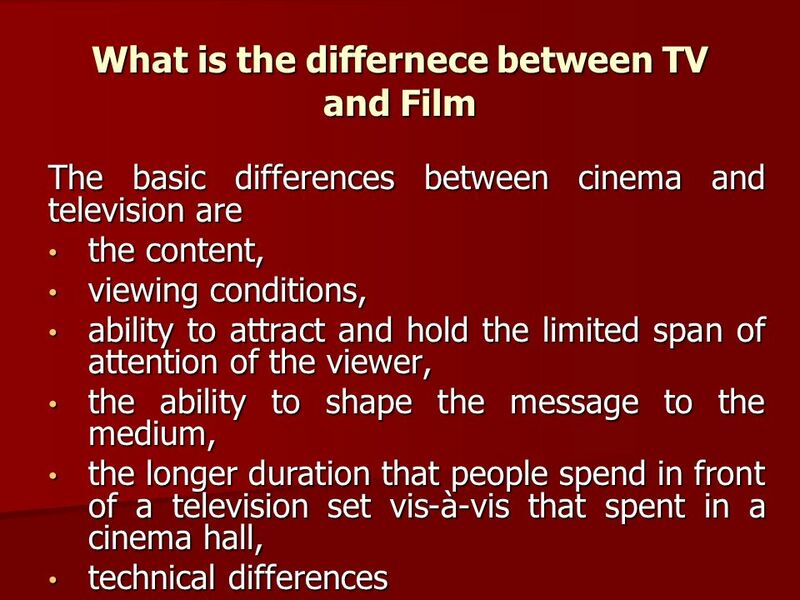 When cinema attendance dropped, Hollywood created widescreen aspect ratios (such as the 1.85:1 ratio mentioned earlier) in order to differentiate the film industry from TV. The 4:3 ratio (generally named as "Four-Three", "Four- by-Three", "Four-to-Three", or "Academy Ratio") for standard television has been in use since television's origins and many computer monitors use the same aspect ratio. 4:3 is the aspect ratio defined by the Academy of Motion Picture Arts and Sciences as a standard after the advent of optical sound-on-film. By having TV match this aspect ratio, films previously photographed on film could be satisfactorily viewed on TV in the early days of the medium (i.e. the 1940s and the 1950s). When cinema attendance dropped, Hollywood created widescreen aspect ratios (such as the 1.85:1 ratio mentioned earlier) in order to differentiate the film industry from TV. 15 16:9 standard 16:9 (generally pronounced as "Sixteen-by-Nine"; alternates include "Sixteen-Nine" and "Sixteen-to-Nine") is the international standard format of HDTV, non-HD digital television and analog widescreen television (EDTV) PALplus. 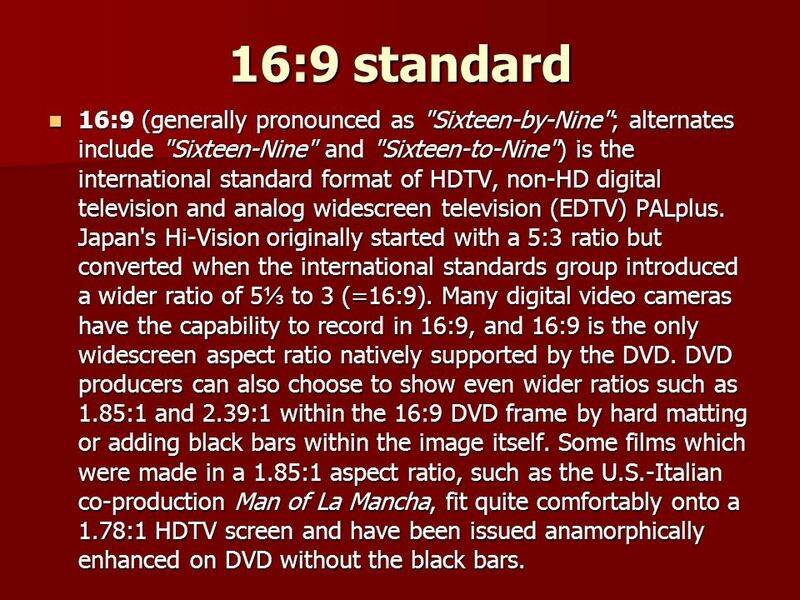 Japan's Hi-Vision originally started with a 5:3 ratio but converted when the international standards group introduced a wider ratio of 5 to 3 (=16:9). Many digital video cameras have the capability to record in 16:9, and 16:9 is the only widescreen aspect ratio natively supported by the DVD. DVD producers can also choose to show even wider ratios such as 1.85:1 and 2.39:1 within the 16:9 DVD frame by hard matting or adding black bars within the image itself. Some films which were made in a 1.85:1 aspect ratio, such as the U.S.-Italian co-production Man of La Mancha, fit quite comfortably onto a 1.78:1 HDTV screen and have been issued anamorphically enhanced on DVD without the black bars. 16:9 (generally pronounced as "Sixteen-by-Nine"; alternates include "Sixteen-Nine" and "Sixteen-to-Nine") is the international standard format of HDTV, non-HD digital television and analog widescreen television (EDTV) PALplus. Japan's Hi-Vision originally started with a 5:3 ratio but converted when the international standards group introduced a wider ratio of 5 to 3 (=16:9). Many digital video cameras have the capability to record in 16:9, and 16:9 is the only widescreen aspect ratio natively supported by the DVD. DVD producers can also choose to show even wider ratios such as 1.85:1 and 2.39:1 within the 16:9 DVD frame by hard matting or adding black bars within the image itself. Some films which were made in a 1.85:1 aspect ratio, such as the U.S.-Italian co-production Man of La Mancha, fit quite comfortably onto a 1.78:1 HDTV screen and have been issued anamorphically enhanced on DVD without the black bars. 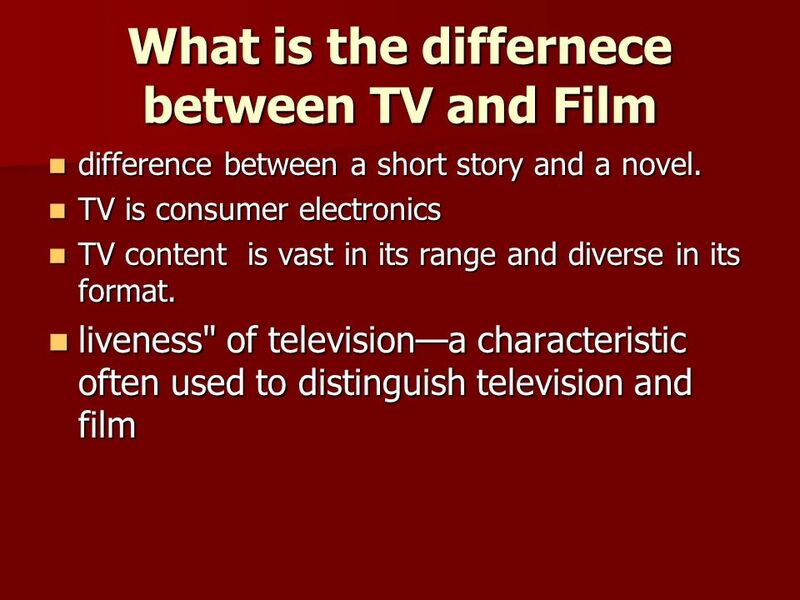 Download ppt "Television Television marked the beginning of a phenomenon that was to have a major impact on news, advertising, film, radio, and the world -- not to mention." TV Digital. Why Digital TV There are two primary reasons: Improved public safety, and The ability to deliver enhanced technology services to the public. Production Process What events happen during the production process? Digital TV StandardstMyn1 Digital TV Standards All digital TV variants can carry both standard- definition television (SDTV) and high-definition television. Storyboarding Film &Video Production 12. Storyboard Important aspect of pre-production stage Sequence of drawings representing how each key frame will. Video Production By Josh Gallagan. Video Production  Professional video production, or videography, is the art and service of videotaping, editing, and. B.Sc. Multimedia ComputingMedia Technologies High Definition Television. Introduction to Television Bellevue Community College Bob Young, Instructor.